Getting Your Read On: My Dearest Enemy by Jennifer Moore + $25 and Book Giveaway! 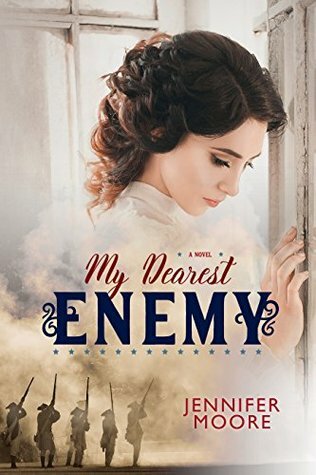 My Dearest Enemy by Jennifer Moore + $25 and Book Giveaway! Struggling alone on the family farm, Abigail Tidwell knows exactly who to blame for her hardships: the Americans. If it weren’t for their part in the war, her father and brothers would be home rather than fighting abroad. But no amount of antipathy could have prepared her for the shocking sight of a wounded American soldier on her property, a man in dire need of her help. Grudgingly, Abigail tends to the soldier’s injuries and anticipates the satisfaction of turning him over to the authorities once he is healed. But fate has other plans. Captain Emmett Prescott remembers little of the ambush on his men by a group of Shawnee Indians and even less about how he arrived in the unfamiliar barn. After being nursed back to health by beautiful, if reluctant, Abigail, Emmett would do anything to save the men he left behind—including forcibly enlisting Abigail’s help. Soon, Abigail finds herself caught between two countries at war. And as her attraction for Emmett grows, her conflicted heart engages in its own silent battle. But when she is accused of treason for her actions, her survival rests in the hands of the very man she once considered her enemy. I really don't know too much about the War of 1812. I can't remember the school history lesson of so long ago but after reading this book, I have the urge to read more about it. Jennifer Moore has written a book that painted vivid images in my mind and clearly she has done her history homework because everything felt so sturdy and real. I love when historical fiction feels rich and makes me want to know more about whatever I am reading. This book was more plot driven than character driven, which left me wanting more of an emotional connection but I did enjoy the story. I loved Emmett and his group of trusted allies who were a vital and ongoing part of the story. They helped give the book a feeling of trust and family- nobody is left behind. - I received a complimentary copy of this book from the publisher. All opinions expressed are my own.